Anyway, the story itself has been adapted to various versions. Many would call it “Okiku and the Plates” or “The Tale of Okiku” which share slightly different plots, although the main story keep intact. I’m just gonna share the basic folk version, while the most familiar version would be the one adapted by Okamoto Kido. Once there was a beautiful servant-maid named Okiku. She worked at Himeji castle or in a Samurai household. Her lord has long fallen in love with young Okiku, and continuously pursue his feelings toward her, which she always refuses in return. After she again refused his attempt to marry, he fall into depression. And it was then that the lord came up with a plan to force Okiku to be with him. At the time, Okiku was responsible for ten precious plates. Each of them was precious treasure of the family, thus was treated with utmost care. By certain time, the plates would be carefully cleaned, counted, wrapped, and sent back to their respectful display. One day, Okiku was just finished wrapping the plates and was ready to send it back, when she left it to do her household duty. During this time, her lord came into her chamber and carefully unwrap the plates. He then took one of the plate and hid it under his clothing. Before he left, he wrapped the remaining plates back as carefully as when he open it, so Okiku wouldn’t suspect anything. When the plates brought back to the main house, Okiku suprised to see one of the plates was gone. Losing or breaking any of it was no light matter, because each mistreated would reward in death. She was so panicked that she ran her hands over each plates. She counted and re-counted the plates with crying voice “One… two… three… four… five… six… seven… eight… nine…Nine! One… two… three… four… five… six… seven… eight… nine… No! It can’t be!” She cried and keep counting the plates with no luck. It was only nine plates in her hands. Realizing the situation, Okiku had no choice but to see her lord. With tears still hanging from her eyes, she told her lord that one of the plates was missing. Her body was shaken really hard for fear of her punishment. Instead, her lord offered to let the situation go away if she would become his lover. Okiku looked up to her lord in surprised, but she remain in her sense and again refused his desire. Her lord became furious with her refusal and killed her in rage. He then throw her body into a well. Only after this incident that it became legend. Just after Okiku was killed, strange voice was heard from the bottom of the well. Water dripping, gently moving far away, and an echoing voice that rose from the depths, at once beautifully soft yet also full of malice. Then there was silence. 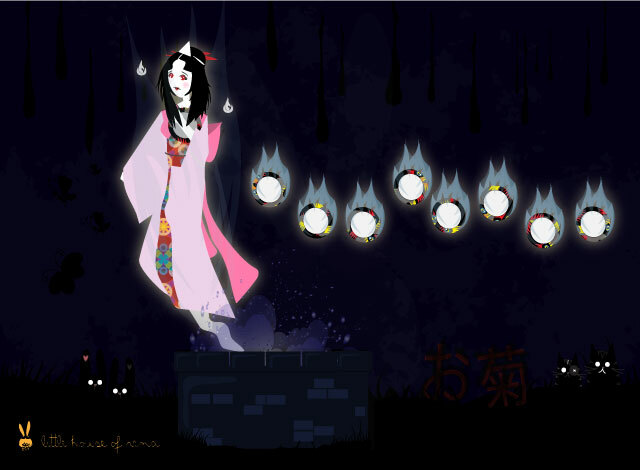 Until a shriek came up in rage, sounded out in place of “Ten.” Okiku has turned into a vengeful spirit (Onryō). She was still trying to find the tenth plate and cry in agony when she never could. The torment continue even after her lord has died. It is said that if we shout “Ten” after she count to nine, her spirit will finally relieved that someone had found the plate for her. Today, there is a well in Himeji castle known as Okiku’s well. It is said Okiku was drowned in this very well and sometimes her voice can still be heard from above the well. 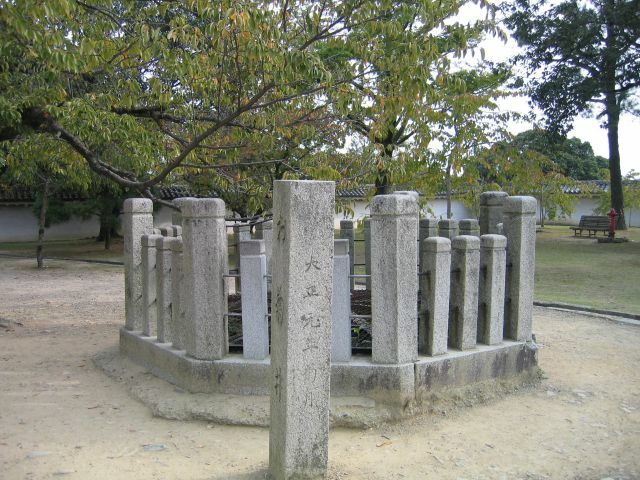 They even covered the well with fence to prevent Okiku from climbing up. Either way, the story of Okiku had inspired many artists to continue her legacy. One of them is the infamous “Ring” horror by Koji Suzuki. In “Ring,” the ghost Sadako will sprung-out from a well into real-life haunting flesh. Scary? No doubt! Another story of Okiku available in Wikipedia. While above story was gathered from several sources online, including this.